The Cowboys reached a long term deal with Dez Bryant less than one hour before Wednesday's deadline. It doesn't look like Dez Bryant will have to skip any games in Dallas. The wide receiver has agreed to a five-year, $70 million deal with the Cowboys, according to NFL.com. Bryant's new deal will include at least $45 million in guaranteed money, according to ESPN. The Dallas Cowboys had until 4 p.m. ET on Wednesday to work out a long-term deal with Bryant, but instead of sweating out things until the deadline, the two sides got the deal done with time to spare. Here's three things to know about the deal. 1. Dez got some serious money. Bryant didn't exactly get the Calvin Johnson money he wanted, but the Cowboys did make Bryant the NFL's second-highest paid receiver. The five-year, $70 million deal means Bryant will make an average of $14 million a year, which will trail only Johnson, who's pulling in an average of $16.2 million per year. Of Bryant's $70 million, $23 million will be fully guaranteed at signing. Bryant will then receive a $22 million bonus if he's on the roster in March 2016, according to ProFootballTalk, giving him a total of $45 million in guarantees since it would pretty much be cost prohibitive for the Cowboys to dump him before March. The guaranteed number puts Bryant ahead of Johnson, who made $43.75 million in guaranteed money when he signed his new deal in 2012. 2. Dez won't be missing any games. Bryant had threatened to sit out training camp and even miss regular-season games if a deal didn't get done. The Cowboys would've definitely missed Bryant, who's caught 50 touchdown passes since 2011, a number that ranks first in the NFL. 3. The deal makes sense for both sides. Although things sometimes seemed contentious between Bryant and the Cowboys, the deal that got done makes sense for both sides. Bryant gets the security of a long-term deal and the Cowboys will go to sleep tonight knowing they have the 26-year-old Bryant locked up for the prime of his career. Cowboys quarterback Tony Romo probably let out a sigh of relief after he heard that the deal was done. Bryant is Romo's go-to guy, especially in the red zone. If you need proof of that, just consider this: Bryant has caught 44 percent of the 93 touchdown passes Romo has thrown since 2012. Bryant has also caught at least 25 percent of all the passes Romo has completed in that same time period. Bryant gets his money and Romo gets his favorite receiver back: Everyone in Dallas wins. NOTE: This story was originally setup as a live blog and you can read the timeline below to see what transpired during negotiations in the hours leading up to Wednesday's franchise tag deadline of 4 p.m. ET. Things got so crazy over the past 24 hours that a player for a rival team -- Redskins cornerback DeAngelo Hall -- offered the Cowboys some negotiation advice. 3:30 p.m. ET: Dez has officially signed his contract. 3:07 p.m. ET: With 53 minutes to spare, it looks like a deal between Bryant and the Cowboys is officially done in Dallas. 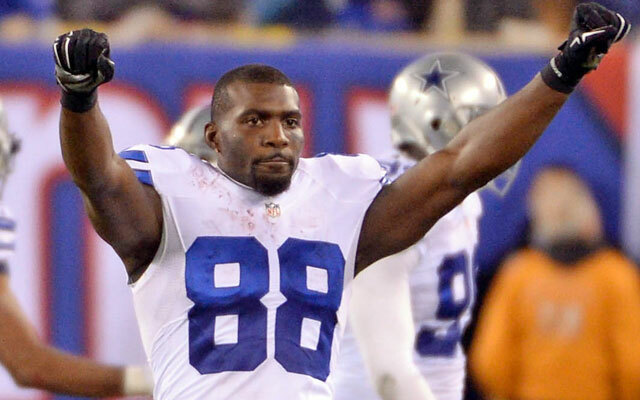 The #Cowboys and Dez Bryant have an agreement in principle on a 5-year, $70M deal, per sources. 2:47 p.m. ET: Although we don't know the financial details of Bryant's potential contract yet, CBS Sports NFL Insider Jason La Canfora does have one tidbit. 2:36 p.m. ET: If the Cowboys were sweating this deal, there's going to be a lot less sweat at Valley Ranch because this deal might not actually go down to the 4 p.m. deadline. NFL.com's Ian Rapoport has reported that the two sides are finalized a deal. Source: The #Cowboys and Dez Bryant are finalizing a long-term contract extension. It’s happening. 2:30 p.m. ET: Cowboys fans, you might be able to rejoice: ESPN's Adam Schefter has reported that Dez Bryant is headed to the Cowboys practice facility. Dez Bryant now on his way to Cowboys' facility -- assuming the two sides can put finishing touches on deal. 2:13 p.m. ET: Stephen Gostkowski is basically rubbing it in: The Patriots kicker, who was hit with the franchise tag in March, has worked out a long term deal with New England. According to a league source, the Patriots and kicker Stephen Gostkowski have reached agreement on a contract extension. 1:46 p.m. ET: This would make for a fascinating day. As someone who loves chaos, I would be highly impressed if the Eagles signed Dez to a $90 million offer sheet in the next 15 minutes or so. 12:22 p.m. ET: A deal isn't done yet, but Charean Williams of the Fort Worth Star-Telegram says that things are looking good. There is optimism at Valley Ranch that a deal with Dez Bryant gets done right at the deadline. 12:11 p.m. ET: CBS Sports NFL Insider Jason La Canfora believes that Bryant will end up taking the Cowboys best offer and right now that looks like it would be a deal worth about $13 million per year. 11: 41 a.m. ET: The Cowboys are pretty much experts at getting a deal done at the last minute. As ESPN.com's Todd Archer points out, in 2008, the Cowboys hit Ken Hamlin with the franchise tag and didn't get a deal done until the deadline. 9:31 a.m. ET: The franchise tag would pay Bryant $12.8 million in 2015, but he wants more than that. The Cowboys have shown they're willing to pay more than that: The team upped their offer to Bryant on Wednesday morning. The offer apparently wasn't high enough though because there's still no deal. Raiders blowing NFL draft smokescreen?